Ken Quantick, 71, drives recycling lorries for Brighton and Hove City Council in the Lewes Road area. His three-man crew covers a round that stretches from Bear Road to Asda in Hollingbury. Mr Quantick claims Veolia, the company responsible for disposing of Brighton’s rubbish, has told his crew to tip all their recycling into the household waste facility. “This means our eight tonnes of recycling a day is going straight into the incinerator at Newhaven,” he said. He says this is because the company cannot cope with the amount of recycling being taken into the Hollingdean depot. But Veolia claims it only rejects recycling which has been contaminated. Mr Quantick said his crew had “a very low contamination rate” and had not had any problems over the past two years. “This is a scandal,” he said. “The public need to know what is going on. Mr Quantick said Veolia had told him and his crew their recycling was contaminated with black bin bags and old recycling boxes, which meant whole loads were being burned. Pictures from the depot appear to show recycling which contains black bags and recycling boxes. But Mr Quantick, a council binman for 14 years, said it was routine for his crew to fill black bags with recycling on some streets where steep banks made it difficult to get wheelie bins to the lorries. He said Veolia only started complaining about this on Thursday. “We have been using this system all year,” he said. He also said some people threw their old black recycling boxes into the big communal recycling bins – which dustmen have no way of checking until they empty the lorries. He said the real reason was that Veolia could not cope with the amount of recycling. “They are overwhelmed,” he said. “It’s a mountain. They can’t clear it quickly enough. They are using this as an excuse. It’s absolutely disgusting. Veolia said: “We are a recycling company and we recycle viable material. “All recycled material that is collected is assessed for levels of contamination when presented at our materials recovery facility in Hollingdean. “Loads might be rejected if it is deemed to contain too high levels of contamination – this is to protect the quality of our end recycled product and ensure the best environmental performance. The council said: “We know there is an issue concerning contamination at the Veolia site. This entry was posted in Communications, Environment and tagged Brighton and Hove City Council, Cityclean, Recycling, Veolia, Waste on 09/01/2019 by srraadmin. Planning Application to remove tree in building development. A neighbour has alerted us that two planning applications have been lodged relating to the development between The Open House and the railway line. “I got a consultation letter through the door from the council the other day, it relates to the development between the Open House pub and the railway line. I thought that was rejected by the council but it now seems they are both active. They want to cut down the sycamore tree even though it is protected and they said in their plans they would keep it. They justify this by saying the ground is so contaminated by cyanide, lead and PAHs that they need to lay down a membrane to protect future inhabitants from the contamination. Great place to build houses! This entry was posted in Communications, Community, Environment, Planning and tagged Brighton and Hove City Council, Planning, Trees on 12/12/2018 by srraadmin. Give it six more months and Brighton’s bin collection problem will start clearing up. Overflowing rubbish bins in Hove. That is the promise made by new Cityclean chief Rachel Chasseaud to long-suffering residents. She says the main issues within Cityclean are poorly planned routes, uncompetitive salaries and a breakdown in communications, which has seen staff morale plummet. High sickness day rates have also played a part in people’s bins not being collected regularly since late last year. There is a long road ahead and Ms Chasseaud insists it will not be a straightforward task – and it will be about two years until the inadequate £10.3 million service is functioning the way it should be. Ms Chasseaud’s plan is to restructure the routes for refuse collections so places that are being missed more frequently are targeted, though this is expected to take half a year. In an interview with The Argus, she said: “It’s amazingly complex as to why there’s been problems. It’s something that’s happened over a period of time, not overnight.In six months people will see a big change. Cityclean has about 90,000 refuse collections, 45,000 recycling rounds and 600 communal bins to clear, in total, per week. As part of a “modernisation programme”, the service is due to undergo an overhaul, led by Ms Chasseaud, which will see a mapping system put in place to track collections. This will make it easier to tackle areas where bins are not collected as regularly, Ms Chasseaud said. Communication with staff has also been a big issue, with many frontline workers feeling their relationship with managers has been non-existent in recent times. Ms Chasseaud, who started her £80,000-a-year job as assistant director on September 3, has been getting to know staff and rebuilding burnt bridges with them and the GMB union. She described the service’s relationship with the union, which in August threatened to take strike action, as “complex” but said a good bond between them is crucial. Ms Chasseaud said: “What I hope I’m already changing is relationships within the service. I’m spending a lot of time talking and listening to staff. That’s something I believe is very important. She is also working on improving communications with residents as soon as possible. Another reason given for the poor service has been staff shortages. A Brighton and Hove City Council report released last week revealed the £20,138 salary for drivers – significantly lower than £25,500 offered in East Sussex – is to be reviewed in a bid to retain workers. The council is currently looking to recruit two additional drivers and four binmen. High staff sickness has also been a contributing factor to the bins debacle which has seen some residents wait more than three weeks to have their rubbish collected. A Freedom of Information request by The Argus revealed a total of 7,228 sick days were taken by Cityclean’s 275 members of staff, which includes office workers and managers as well as binmen, from January 2017 to August this year. The council said the sickness rate is higher among Cityclean workers, and Ms Chasseaud is aiming to improve some health and safety aspects of the service, such as ensuring workers are wearing sufficient personal protection equipment. She said the workforce is of a slightly older generation, too, increasing the risk of injuries on the job. The council report, which is being presented to the environment, transport and sustainability committee today, highlighted staff sickness and stated workers will be offered free health checks. She has confidence in her own ability and has even received the backing of opposition councillors, with Conservative Dawn Barnett believing Ms Chasseaud is the right person for the job. Her contract lasts a year, but she is hoping to impress and take it on permanently. This entry was posted in Communications, Community, Environment and tagged Brighton and Hove City Council, Environment, GMB, Waste on 09/10/2018 by srraadmin. Is it a bird, is it a plane………? No – it’s a Superbin! The first Superbin in Brighton & Hove will land in Preston Park on Thursday, and be unveiled by the Mayor Dee Simson. The bin will be the star attraction at the annual Mayor’s Big Tidy Up, when council parks staff and dozens of volunteer litter pickers will be in action, rolling up their sleeves and sprucing up the popular park. 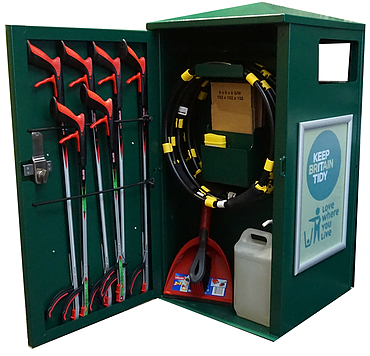 At first glance, the Superbin looks like a normal litter bin, but open the door at the back, and you’ll find a stash of litter picking equipment for use by volunteers. The bin has been installed as part of the council’s Tidy Up Team project. Trained volunteers will be given a code to the bin store, where equipment including litter pickers, gloves and bags are kept, make litter picking events easy to arrange. The council launched the Tidy Up Team last year in a bid to encourage local people to help keep their parks and green spaces tidy by taking part in, and organising litter picking events. The scheme is co-ordinated by Cityparks staff and supported by Cityclean and local community groups. “The response has been better than we ever hoped with hundreds of local people coming forward to offer their help, and keen to organise and run their own community events,” said Park Ranger Garry Meyer. The council runs monthly training courses for volunteers to become Tidy Up team members, so they can safely collect litter in their local parks and green spaces. As a result, litter picking events are now taking place regularly across the city, run totally by volunteers. Councillor Gill Mitchell, chair of the environment committee said: “It’s fantastic that so many residents are coming forward to sign up to the Tidy Up Team projects and help keep our city’s parks and open spaces looking lovely all year round. The new Superbin is unveiled at the Mayor’s Big Tidy up, on August 9 from 11am to 2pm. The bin will enable trained Preston Park Tidy Up Team volunteers to arrange events at short notice without waiting for equipment to be dropped off and picked up. The event will also see the launch of the council’s BIG Tidy Up scheme and information pack, which will enable community groups, schools and businesses to organise their own litter pick events. This entry was posted in Communications, Community, Environment and tagged Brighton and Hove City Council, Litter, Preston Park on 08/08/2018 by srraadmin. The council is developing new guidance – the Urban Design Framework – to help shape buildings and spaces around the city. The aim is to make them easier to use and more attractive to people. As the city grows we will be presented with proposals to develop and build new buildings and places. This provides the opportunity to improve existing areas as well as making sure we get usable, flexible and high quality new buildings and attractive public spaces. To help us achieve this aim, the council wants to learn about your experience of the city to help create more welcoming buildings and public spaces through design. Everyone in Brighton & Hove is invited to take part in a survey to share their views about the places they use and how they think these places could be improved. All over the city there are close-to-home places that people have access to and enjoy spending time in. These can include parks, streets, squares, common areas of schools (eg playgrounds and playing fields), transport facilities and shopping areas. Please fill in the survey at https://www.brighton-hove.gov.uk/udf-places The survey is open until 13 September 2018. The information you provide will help shape the Urban Design Framework which the council, developers and landowners will use to make sure buildings and spaces fit the needs and aspirations of everyone who lives, works, studies in and visits the city. This entry was posted in Communications, Community, Environment, Planning and tagged Brighton and Hove City Council, Community, Planning on 11/07/2018 by srraadmin. This entry was posted in Communications, Community, Crime prevention, Environment and tagged Brighton and Hove City Council, Graffiti, London Road Area Local Action Team on 09/05/2018 by srraadmin. Click on the poster to report a problem. This entry was posted in Communications, Community, Environment and tagged FixMyStreet on 03/05/2018 by srraadmin.